- Though the game features Desmond, Ezio and, Altair as playable characters you don’t really use Altair as I expected. 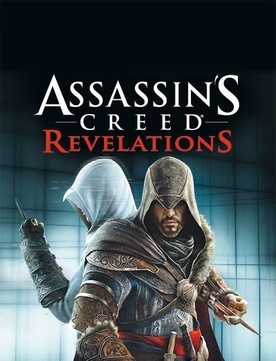 Assassins Creed: Revelations takes place after the events of Assassins Creed: Brotherhood. Desmond is in a sort of a comatose state, but his mind I still active in the Animus. Desmond meets Subject Sixteen in the Animus and he tells him that his mind is fragmenting and it needs to be repaired. The only way to do this is to watch Ezio’s and Altair’s stories till they have nothing else to show him. The story then takes you Ezio’s perspective; Ezio has ventured to Masyaf to try to find out the true purpose of the Assassins. When he arrived there he is taken into custody by the Templars. They try to kill him but he escapes. Ezio finds Altair’s library under the castle but realizes that he needs 5 keys to open the door. Visually the game looks as good as Assassins Creed: Brotherhood did. Environments and characters are detailed, Skylines are awesome, and you can just about travel as far you can see. Audio wise the games is a hit or miss. The dreary mid-evil music goes good with the story’s timeframe. The NPCs comments can get repetitive and annoying after a while. Assassins Creed: Revelations feels like an upgrade form the last games. New to the game is the hook-blade, which can be used as a weapon or as extension of your arm. You also can use it on zip lines to get form building to building quicker. Bombs are also new to the game; there are a slew of them you can craft by finding ingredients around the environment. You can also purchase them form dealers around the towns. Multiplayer isn’t much changed since Brotherhood, but I am able to play more matches so that is a plus. For the most part I was pretty satisfied with Assassins Creed: Revelations. It served its purpose in wrapping up both Ezio and Altair’s stories. There are a few things that bugged me though; Revelations doesn’t truly wrap up Ezio’s story, the only way to see what truly happened to him is to watch the Ubisoft short Embers. The game was far too short for my liking, for some reason it felt like it was about half the length of Brotherhood, while technically it was only a little bit shorter. This is mostly do to that there aren’t as many side missions which are a bit of a let down. I also hated playing as Desmond in this game, whose ever idea it was to make it first person should be fired immediately. This Game did leave me on the edge of my seat waiting for the next game, which I am assuming will be solely staring Desmond as the main protagonist. I can't wait…..
Kingdom Hearts 3D (Dream Drop Distance) - News!!! HTC T-Mobile Sensation 4G Updates!! !